The second article was kindly given by Mrs Ella Cardno nee Summers, Stamford Bridge,Yorkshire. On entering our village from the North End, the first sign of business activity is from an out-room joiners shop occupied by Sammy Robertson, whose wife was a big buxom woman whose only rise to fame was the day she entered Mrs Bannermans house, sat down on a pile of gramophone record and broke them. The story went round the village that Babby had broken the records. The next place of business was the double fronted general merchants, J. Boyes Sinclair which was a grocers, wine and spirits and drapers and before my time, it had a big country trade. The shops I remember most of all were the wee sweetie shops. The first one being Jeannie Horne’s whose father was known as Stick Horn through the fact he had a wooden leg. His leg had been amputated at the knee and he had a black wooden stump, not that unlike a table leg. Jeannie’s shop was rather small, it being a living room and shop divided by a curtain. She sold sweets and cigarettes and was famed for selling a ½ d lucky bags. Our next encounter was the high class shop of George Brown, 30 High Street. It was always a better class establishment. They kept their sweets in drawers in the counter and they also provided chairs for weary customers who had walked many miles to shop at Browns. I still have one of those chairs. I bought it and painted it white as a bathroom chair. There was an upstairs in Browns for showing woman’s wear, hats and coats etc. What I remember most about the said establishment was at Christmas they dressed one of the windows with a huge Father Christmas and a made pond with a mechanical swan sailing round it. It fascinated me and others. Browns used to put out a printed letter to all unsundry. The heading was always the same “Broons Troosers Down”. This was prior to a sale. On the opposite side of the road was the famous hiring business of Hendy Horne Horse Hirer. Then Bisset the Butcher. Our next port of call on the same side was Gracie Goodals who sold monster rock and 1p a bar which to us was rather expensive. Across the street we came to the old lodging house where tramps and mere do wells got a nights bed at the expense of the local parish council. We traverse across the street to Cookie the watchmakers whose shop was at 45 High Street. He sold watches clocks and gramophones and records. He had a good business. Our next encounter was over the mill brae to Wullie Bains. I can faintly remember the side window of Bains being full of Fry’s Cream chocolate and the front window having hard fish in it also a black cat lying on top of the fish. Incidentally Wullie Bain moved from the corner shop and Wullie Rennie altered it to be a butchers. Some time afterwards. Will Bain took over Alex Corbett’s cycle shop at 57 High Street. Strachen the bakers was across the lane from Thompsons. They had two vans the country one was driven by Robbie White 121 High Street .At one time the village van was driven by Wullie Milne tinsmith the present senior partner of that establishment. 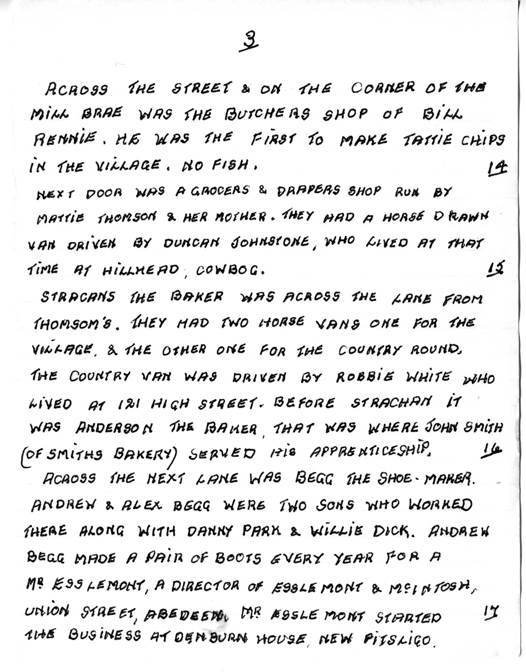 Beggs were the only shop in the village to make homemade boots. Old Andrew Begg made a pair of boots yearly for a Mr Esslemont director of Esselmont and McIntosh of Union Street Aberdeen. 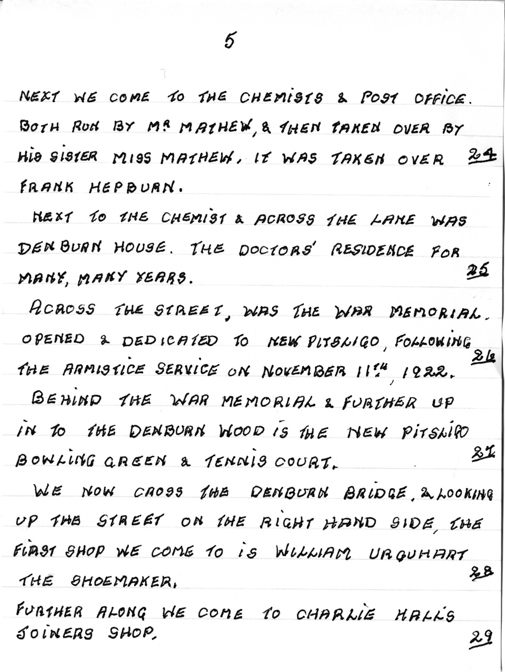 Incidentally Mr Esselmont started business in New Pitsligo at Denburn House opposite the chemist. At an angle of forty five degrees opposite Beggs is the Pitsligo Arms Hotel. Next it was the Commercial bank which only opened twice a week, then the poor inspector’s office where the locals paid their rates. It was run by a Mr Leith who was followed by Mr D Morgan. Our next call was the bank of Scotland with Mr Ritchie at the helm. He held that post for a long time. Crossing the street again and next to Beggs was Will Mitchell the tailor ie mams father. Moving further up the way we come to Alex Corbett cycle shop which Wullie Bain took over. 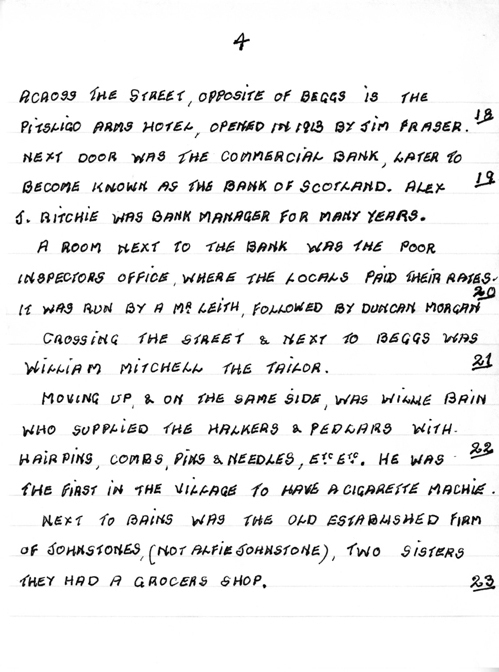 Wullie Bain also supplied hawkers & peddlers with there wares such as hairpins combs etc. He was the first merchants to have a cigarette machine. The story goes that the chaps from Henry Hornes garage use to file certain sizes of washers that worked the cigarette machine and emptied it one weekend with the use of washers, it was quickly removed after the incident. Some time after this the TSB bought the property and commenced in business at their present address. Next to Bains was the old established firm of Johnstone, not Alfie but Jeannie and Jessie Johnstone. They were not very house proud. What I can remember most adout them was they kept several Shetland ponies in the howe amongst the rashes below the old manse in the low street. These ponies were black. The chemist and Post office comes next run by a Mr Matthew otherwise known as druggie Matthew to be succeeded by my dearest friend Miss Matthew. She was by far my best boss I have had in my career at the Post Office since 1935 till her retirement. Across from the post office was the war memorial of which it has been said was designed by my late great grandfather. Behind the memorial is the bowling green and next to the chemist and Post office was Denburn House which before being the doctors’ house was divided into flats. One of the flats was occupied by Mr Will who was at one time Headmaster of the High School in my parent’s time. He was the father of the late Webster Will. It is strange that a grandson of the said Mr Will now occupies a flat in the same building. I omitted to mention that the property owned by Mary King was formerly owned by Dickey and prior to that was the boot makers Carles this was Harry Ogstons fore bearers on his mothers side also Carle the Solicitors Aberdeen. 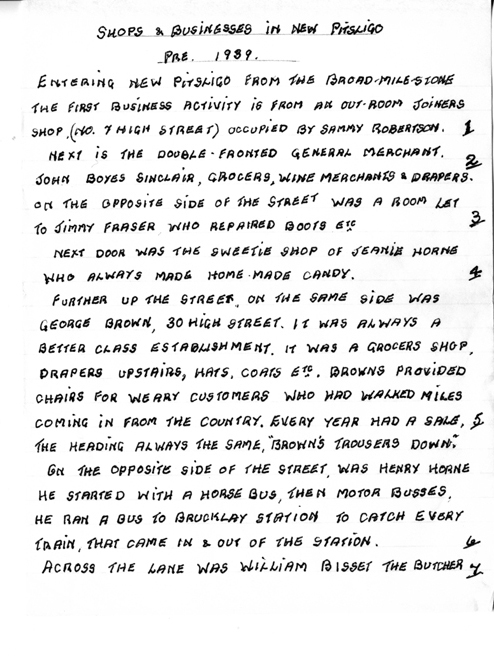 Another omission Jimmy Fraser had a shoe makers shop next to Jeannie Hornes prior to going to a farm at New Deer. The Frasers lived at the Broad milestone the croft that is now owned by the laird. I omitted to mention that at certain times of the year we boys used to go to the chemist and buy a ½ d of cinnamon stick and at other times 1d worth of hard black sugar to make sugary water. As a boy I had to call at the chemist each time I came home from school to pick up the Glasgow Bulletin. it was a picture paper ,if my memory is right the girl behind the counter was a Mary Noble ,she used to try me out with samples of chocolate laxatives .I used to take them and give them to certain people who during the depression a sweetie in any form was a very welcome sight. although the aftermath was annoying to say the least. We venture across the Denburn in the spring time in the spring time and early summer the rhododendrons are beautiful. The walks in the upper part and the burn itself were always kept immaculate by Lord Clintons staff of wood cutters. The march burn was always cleaned out during the winter months this kept the field drainage in working order and I suppose in the long run saved the estate money. I am afraid the present set up does not think so as the burns are chocked with weeds and muck. If I had anything to do with the government subsidies I would not pay out until all those burns were cleaned out and field drainage up to scratch, I am sorry for going on about the later but this is how I feel. Next we come to the Public hall which was the finest village hall round about we were indeed lucky in that respect. Our next shop was Wullie Jack the baker, who also sold sweets and tobacco. Our main subject was he sold locust beans, we at the Chapel school (St Johns) made a bee line for Wullie jacks at break time for a !/2 d of locust beans(Sheep’s feed) and enjoyed them. Across the lane we came to Alex Shand`s who specialised in Hams etc..It was a sight worth seeing Alex Shand himself boning ham on the counter. He also sold a big variety of cheeses. It was Alex Shand that supplied us with our school text books i.e. This is a subject that I am hot on why cannot the better off parents not buy their children’s text books as we had to do in years gone by when folks were not so well off. This in itself would save the education authorities tens of pounds also if the children had to buy pencils and jotters they might take more care of them. Leaving Alex Shands the shop we call next was Robbie Paterson tailor this was in Mary Whyte`s out room. When Wullie Mitchell came out of his tailors shop at 56 high Street and went to the pub at Byth,.Robbie Paterson took over the shop. Crossing the Square we had Alec Ralph`s shoe maker. Alec like Jimmy Fraser had legs off as the result of the 1914- 1918 war. Right opposite Ralph`s was Davy Beadies barber shop otherwise known as Hugh B Clark, giving the man his right full name. He also sold newspapers and also the green final on a Saturday night around nine pm. His shop was eventually closed and he took over Willie Jack’s at 67 High Street. We cross the street again and call at Jessie Morgan’s who sold sweets and cigarettes also hot pies, bradies and tea which were served behind a curtain on tables that were laid out with chairs etc. Our next port of call was Alex Sangster, this is a comparatively new shop. This building was owned by a family called Corbett and was divided into four flats. We lived in two parts of it. On top next the lane George Taylor and his wife lived. She was a Johnstone from Broomhill, Her father was a road Foreman. Next door was our abode and immediately below us was Jock Clark and at the other end was Slater Hutcheon. When he left a family called Davie lived in it. When Jock Clark left we moved into the bottom area. I remember there was a washing house with a boiler so that each tenant had a day to wash. 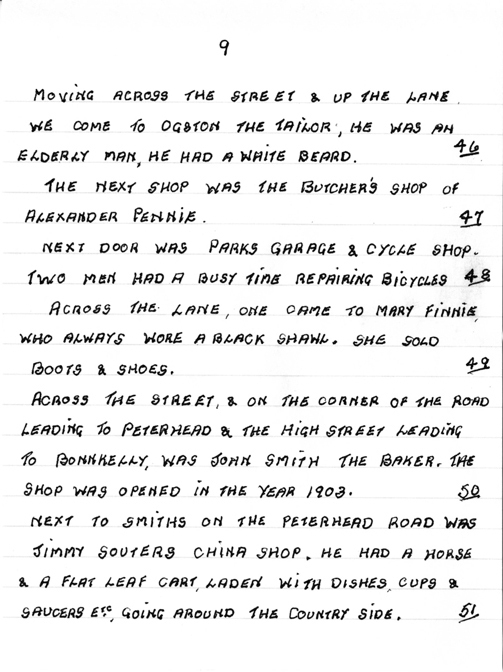 The following establishment was Duncan Anderson’s cycle shop and opposite it was the Macduff News. This was there office, the paper was an advertising venture and was given away free. When they moved out Wiillie Urquhart the postman moved in as a shoe repairer, the building was latterly sold to Buchan who ran a Chip shop. Our next establishment was Wallace the Blacksmith on the smithy lane. My father often sent me to the smiddy for bolts etc for jobs and he always wanted immediately. I was scared as the oaths that cane from Wallace’s mouth were not printable. For all that they were a very nice family. Moving across the street and up the lane we come to Ogston the Taylor. The son walked with a crutch as he had only one leg, the old man had a white beard. His daughter was Maggie Ogston who had a son called Stuart Ogston, they lived at34 High Street. Then next door was Parks Garage and cycle shop. Across the lane we had Mary Finnie who sold boots and shoes. She kept a very clean shop and always wore a black shawl as was customary in those days. Our next stop was the main employer in the district that of John Smith and Sons Ltd, before the building was extended we used to be fascinated by the making of farthing biscuits which were made in a machine, the dough was placed at one end and the biscuits came out at the other end, then they had to be transferred to an oven for heat treatment. That was one of our local treats before we had a chip shop, was a penny of broken biscuits, they were smashing especially if there were burned ones amongst them. 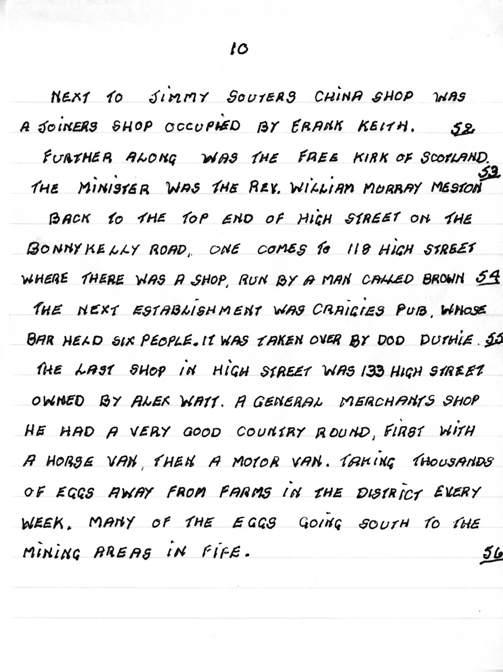 Next to Smiths was Jimmy Souters China Shop, when I was a child my parents use to walk out the Duncan Brae on a nice Sunday afternoon and call at Jimmy Souters on the way into the village. Jimmy always sat on the window sill talking to passers by. Next to Jimmy Souters was a joiners shop, ran by Frank Keith, This was taken over by Jimmy Murray who married Miss Allan, a teacher at St John’s School. Our next call was the Free Kirk with one of the most pleasant Preachers there ever lived Mr Meston and his dear wife Mrs Meston. They did some valuable work in this world. The next business was Cruden the Carriers at the top end of the Low Street. I remember auld Jock Cruden had not a hair in his head. We go up the lane towards the top end of the High Street and at one time at 118 High Street a shop was ran by a man Brown, this was before my day. The next establishment was Craigies Pub whose bar held approximately six people at a push. That is where I was introduced to under age drinking the kitchen of the said run, and old Mrs Craig. The outstanding thing I remember about that area of Low Street was a property owned by a family of Noble whose end house was a barn with a threshing mill run by a horse on a bridle path at the rear of the building. At the bottom left side of the square were the sheds owned by Rob Finnie who owned a steam sentinel wagon he contracted to the County Council roads Department. We proceed down Low Street, down the Den Brae up the other side by the gas works which was non existent by my time, only the chimney stood, gaunt and an emptiness, covered in nettles where the building stood. 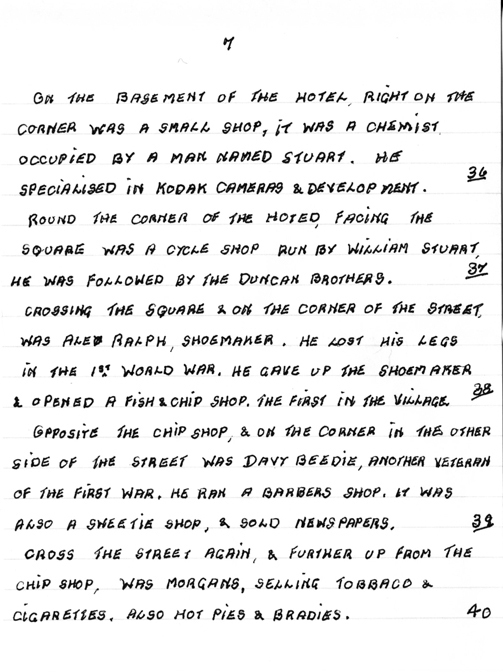 The next shop was run by my late mother, Mrs R Wallace, for anyone’s information my mother was a time served grocer having served her apprentice ship with John Duffus 61 high Street. “Alex Shand’s” along with the late Geo Guthrie, Cairneywhing. At the far end of Low Street before my mother came to have a business a general shop was run by Andrew Robertson. During my mothers time there were two start ups, Shearers and Bazil Knox who hailed from Glasgow but those both failed. My parents gave up when decimalisation came in; Father could not be bothered with the new fangled money although it is easier to handle, personally speaking we were coned in this operation. At the far end of Low Street was the Parish Church Manse with the very brilliant scholar in the Rev John Mac William. Had he had his sight we in New Pitsligo would never had the honour of knowing such a man. He was an honours graduate of Oxford University and I have a faint feeling a member of the unknown then, Marxists Group. Another building that needs a mention is the old Meal Mill at the bottom of the Mill Brae. The Millar in my young day was Geo Rollo, “Nell Rollo`s father” He was followed by a man named McIntosh who was the last millar. I had better mention my fore bearers who were carpenters and joiners of very high esteem. They were responsible for many farm houses and steadings on the Bonnykelly Estate , also the Parish Church., and 30 High Street N. P. then owned by G Brown They employed about six men and apprentices in there hey day. Entering the village from the North End, the first sign of business activity is an out-room Joiners shop occupied by Sammy Robertson. The double fronted General Merchants of John Boyes Sinclair. It was a grocer and draper and also had a licence for wine and spirits. Jeannie Home’s wee Sweetie Shop. Her father was known as “Sticky Home” and she was good at making sticky candy. High class shop of Geordie Brown, 30 High Street. It was a better class establishment. They provided chairs for weary customers coming in from the country. Upstairs there was a room for “Ladies Wear” — hats coats and dresses. Across the street was the hiring business of Henry Home. He started with a horse bus then motor bus. A bus ran to Brucklay Station every day to catch every train coming and going from the station. Across the lane was William Bisset, Butcher. Next door was Gracie Goodall’s Sweetie Shop. Across the street was the old lodging house, where tramps and homeless people got a bed for the night, for a sixpence. The caretaker was Rob Barrie who had only one leg. He went there in 1927 when he moved out of Backburn. Across the lane was Jeannie Bodie’s Sweetie Shop which sold home bakes and mincemeat slices, etc. 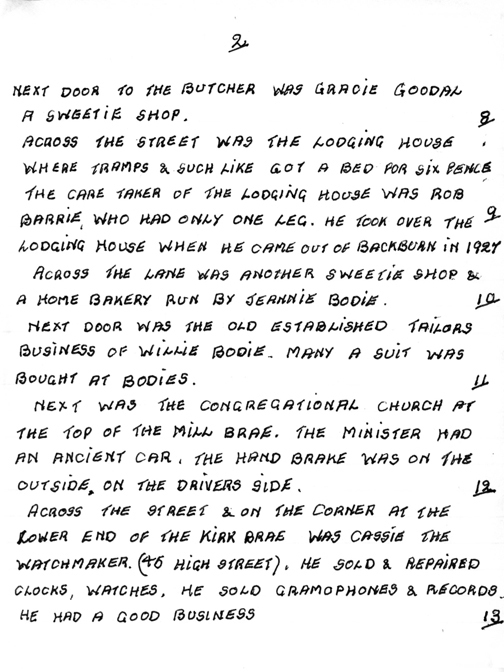 Next door was Willie Bodie’s Tailor’s Shop where many a suit was measured and bought. Next was the Presbyterian Church. The minister had an ancient car with the handbrake on the outside at the driver’s side. Across the Mill Brae was Bill Rennie, Butcher who was the first maker of tattie chips in the village — but no fish. Across the street, on the corner of the brae was Cassie the Watchmaker, 45 High Street. It was a busy shop and he sold and repaired clocks, watches, gramophones and records. Next to Rennie the Butcher was a grocer and drapers shop run by Mattie Thomson and her mother. They had a horse drawn van doing a country round, the driver was Duncan Johnstone. Across the lane was Strachan the Baker who had two vans, one for the country and one for the village. The van for the village was driven by Tinnie Milne and the country van was driven by Robbie Whyte. Mr Esslemont, a Director of Esslemont & McIntosh, Aberdeen. Mr Esslemont started the business at Denburn House, New Pitsligo. Across the street was Pitsligo Arms Hotel owned by Jim Fraser. Further down the street was the Commercial Bank, now the Bank of Scotland. Next door was the Poor Inspector’s Office and Rates Office which was run by Mr Leith and then Duncan Morgan. Next door was the Union Bank of Scotland. The bank manager was Alex .1 Ritchie, who held the post for a long time. Across the street, next to Begg’s was William Mitchell the Tailor — Mima Mitchell’s father. Further along was Alex Corbett’s Cycle Shop which was taken over by William Bain. He supplied the hawkers and pedlars with their merchandise, such as hair pins and combs, etc. He was the first to have a cigarette machine in the village. Next was an old established shop of Johnstone’s, which was run by Jeannie and Jessie Johnstone. The Chemist and Post Office was next, run by William Mathew who was succeeded for a long time by Miss Matthew, and then by Frank Hepburn. Across the lane was Denburn House which was the doctor’s residence. Further along was Charlie Hall’s Joiners Shop. Further up the street was the Public Hall which was opened in 1898. 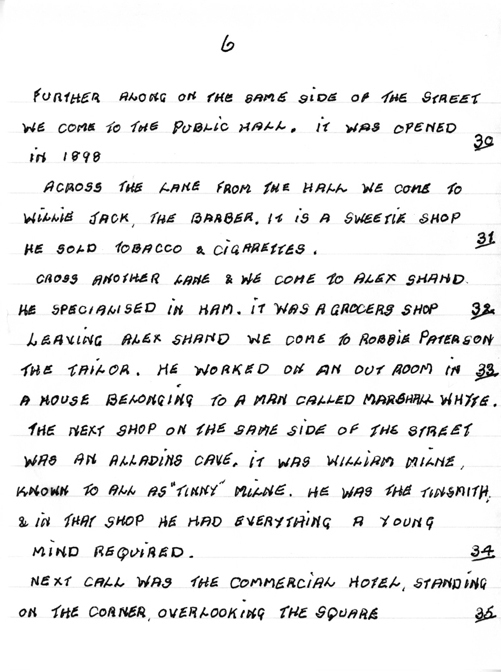 Across the street at 69 High Street was Alex Shand the Grocer. 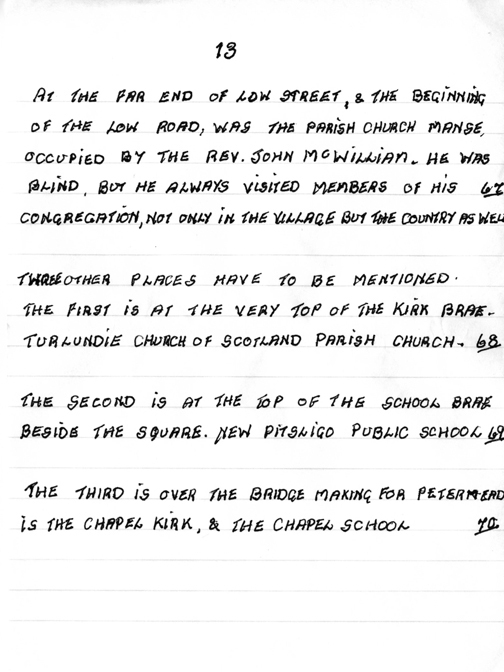 He was the organist in the Chapel Kirk. Next door in an out room, Robbie Paterson had a Tailor’s business. Across the lane at 73 High Street was William Milne the Tinsmith. Next port of call was the Commercial Hotel on the square. Under the Commercial Hotel, on the ground floor’ was a Chemists Shop occupied by Charles Stuart, who specialized in Kodak cameras. Round the corner, facing the square was a Bicycle Shop owned by Willie Stuart. Crossing the square, on the same side, just on the corner was Alex Ralph the Shoemaker, who lost his legs in the First World War. Opposite Ralph’s on the other side of the street, just on the corner was Davy Beedie, who was a Barber, Newsagent and Sweetie Shop. He was a POW. in the First World War. Across the street was Jennie Morgan, who sold Sweets and Cigarettes also Hot Pies and Bridies. Tea was served on a table. 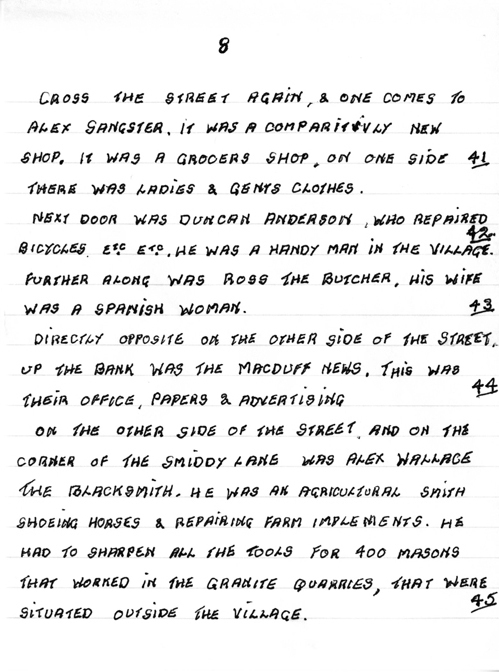 Across the street at 86 High Street was Alex Sangster’s Grocers Shop. Next to that Duncan Anderson had a Cycle shop. He could turn his hand to anything. Opposite on the other side was an office for the Macduff News, Advertising Papers. Across the street, on the Smiddy Lane, was Wallace the Blacksmith. Moving across the street and, up a lane was Ogston the Tailor. Across the lane was Alex Pennie the Butcher. Next door was Park’s Garage and Cycle Shop. Across the lane was Mary Finnie who sold boots and shoes. Across the street on the corner was John Smith the Baker, which started in 1903. Next was Jimmy Souter who had a China Shop. Next was a Joiners Shop owned by Frank Keith. Next call was the Free Kirk. The minister was William Murray Meston. Next business was Jock Cruden the Carrier, situated at the top end of Low Street. Going up the top end of High Street at 118 High Street was a shop owned by a man named Brown. Next establishment was Craigies Pub, which held six people. It was later owned by Dod Duthie. Last shop in High Street was Alex Watt the Grocer at 133 High Street. He had a good van round in the country. 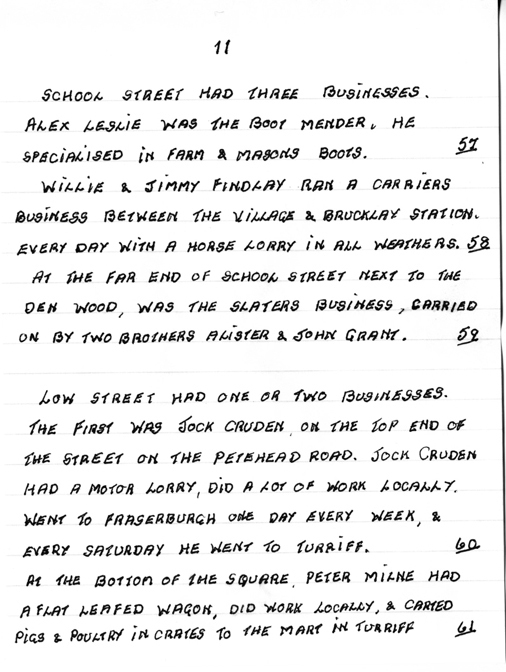 School Street had three businesses — Alex Leslie the Boot Mender at 5 School Street. He specialised in repairing farmers and stone masons boots. Willie & Jimmy Findlay ran the Carrier’s business between New Pitsligo and Brucklay Station daily with a horse drawn lorry in all weathers. At the far end at 15 School Street, next to the Den Wood was Grants the Slaters, which was run by two brothers. On Low Street, at the bottom of the square was a small General Merchant’s Shop, which was run by and old lady called Mrs Bath. Going down the square, at the bottom left hand corner, was Rob Finnie and his steam engine, working for the old county council roads department. 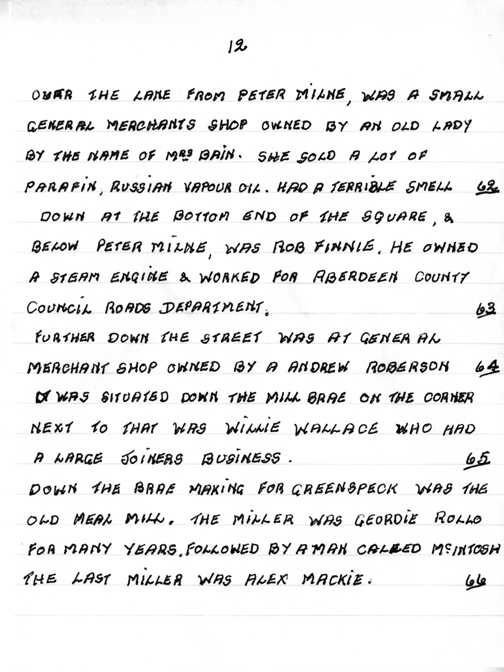 At the bottom of the Mill Brae at 43 Low Street was another Grocer’s Shop run by Mrs R Wallace. At the far end of Low Street i.e. facing Netherton, was a business run by Andrew Robertson. At the very far end of Low Street, on the entrance to the Low Road, stood the Parish Church Manse, the residence of John McWilliam the Minister. Turlundie Parish Church standing on top of Turlundie Hill, also the Public School on top of the square.